This superb book provides a complete, yet simple, gun dog training course to enable you to train your retriever, spaniel or bird dog the professional way. It is the ideal book for amateur gundog trainers. 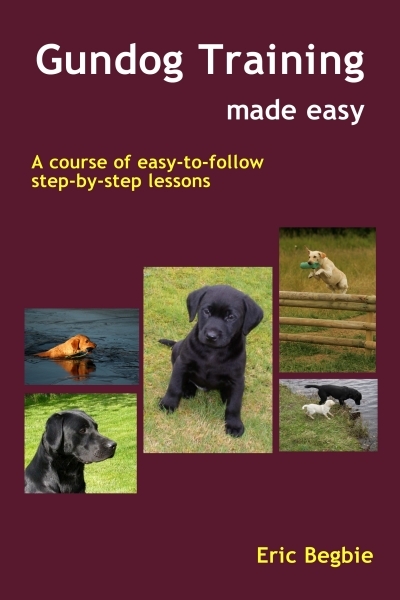 Gundog Training Made Easy by Eric Begbie is a detailed set of step-by-step lessons based on his famous set of Gundog Training Broadsheets that have been used by many thousands of gundog and hunting enthusiasts in dozens of countries around the world. This superbly written book provides a wonderfully explicit training course for training any gun dog or hunting dog. It is ideal for retrievers, bird dogs or for spaniels and is equally valuable for obedience training of pet dogs. In addition to the structured training course, graduated according to the age and stage of the puppy, there is a section of Frequently Asked Questions and a wealth of other information. Importantly, this book uses only positive humane methods of dog training and totally avoids aversive techniques. A must for every dog owner. "If you only ever buy one gundog book, this should be the one!"